The week of vacation is over and it feels like I have PVED: Post-Vacation Exhaustion Disorder. I need to take a vacation from my vacation. Recovery mode involves sleeping late in my own bed, not riding my bike today, trying to get back to reasonably portioned meals, not eating ice cream treats at every turn, and perching on my easy chair to watch some World Cup games. 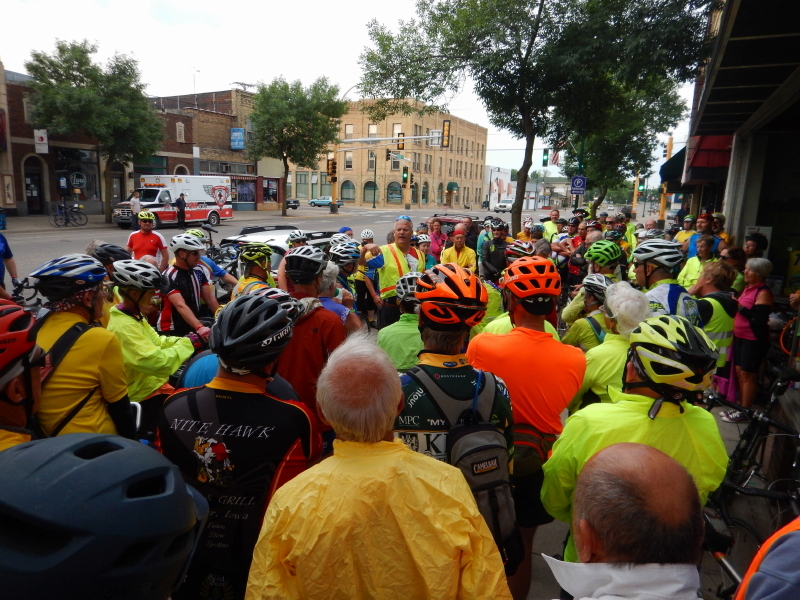 The 2018 Tour of Minnesota was a mix of riding roads and trails in both good and bad weather. As my recovery progresses, I expect to get my camping gear dried out, do an assessment of the Wintervale chores looking for attention, and most of all today, enjoy a celebration of Elysa’s birthday. She and Cyndie are in the kitchen preparing a large variety of delicacies for a gathering of many expected guests. 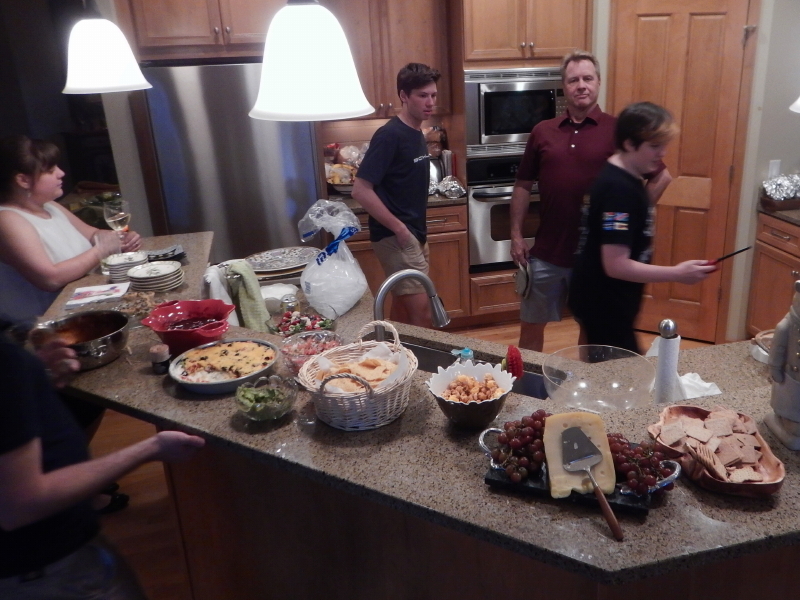 Sunday evening was definitely the grand finale of the weekend family celebration of Cyndie’s milestone birthday. It would have been easy to confuse the occasion with a Friswold Christmas dinner for a number of reasons, most noticeably, the inclusion of the artificial tree (left up all year in the rarely used basement these days). Cyndie’s parents and brothers planned, prepared, put together, and pulled off one heck of a spectacular customized evening to give the birthday girl exactly what she wanted, and more. 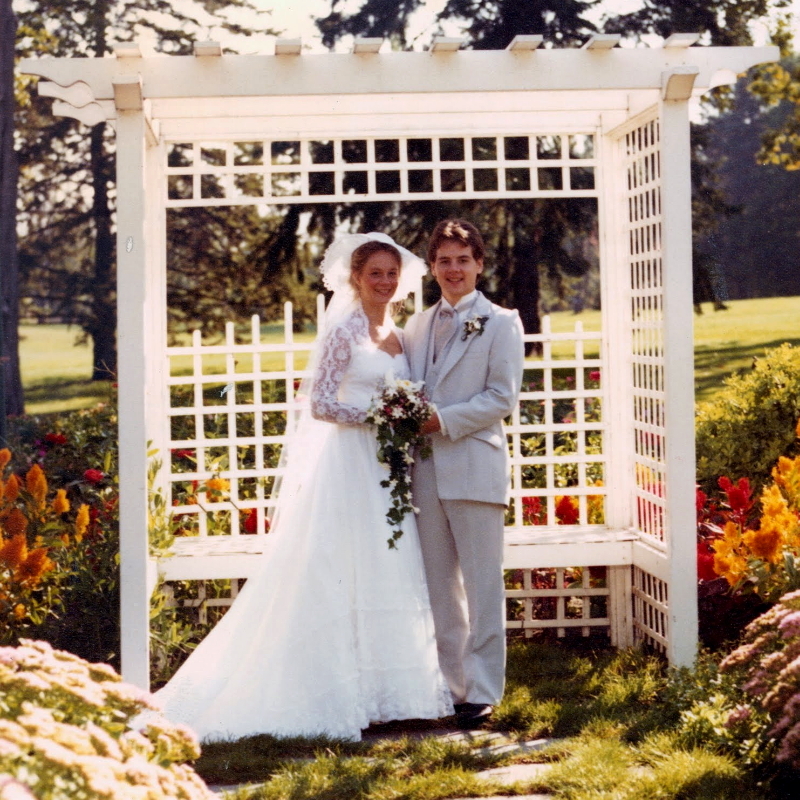 With tie-dye patterned flags and a “peace” banner adorning the tree, they presented a basket filled with a wide variety of crazy photos of Cyndie in every stage of life. 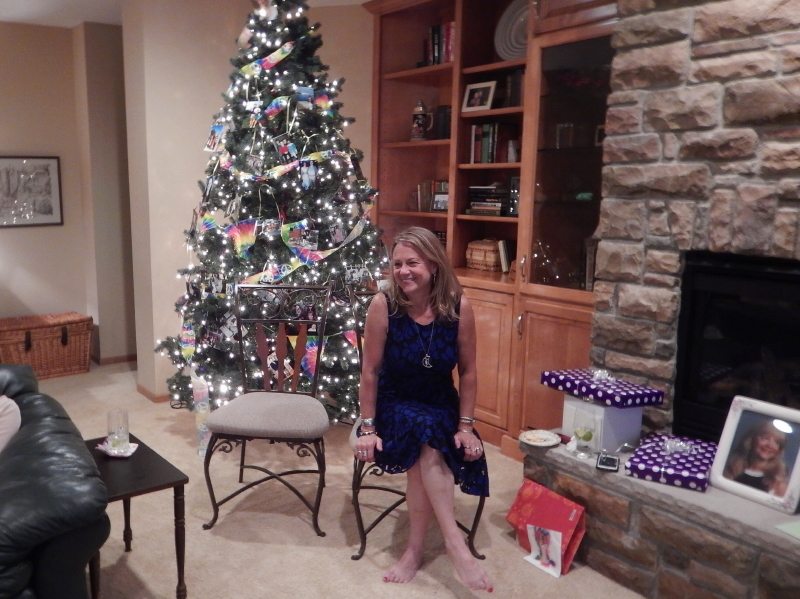 Family members took turns selecting photos to hang on the tree, presenting each with a personal message for the girl. Love overflowed. The tree and Cyndie glowed. Fred offered readings from some ancestors’ letters providing fabulous historic perspective, followed by a powerful statement written recently by brother Ben, addressing present-day issues. 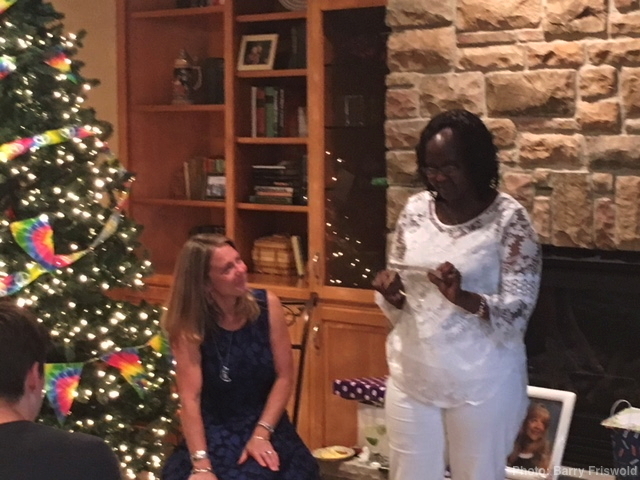 The profound meaning of this sharing was perfect for an occasion to honor and celebrate Cyndie, especially with honorary “adopted” sister, Rabi, from Kenya present (who surprised Cyndie by flying in from out-of-town for the event). There was also a light-hearted reading from Marie, ala the custom-composed candy prose she masterfully wrote and designed. 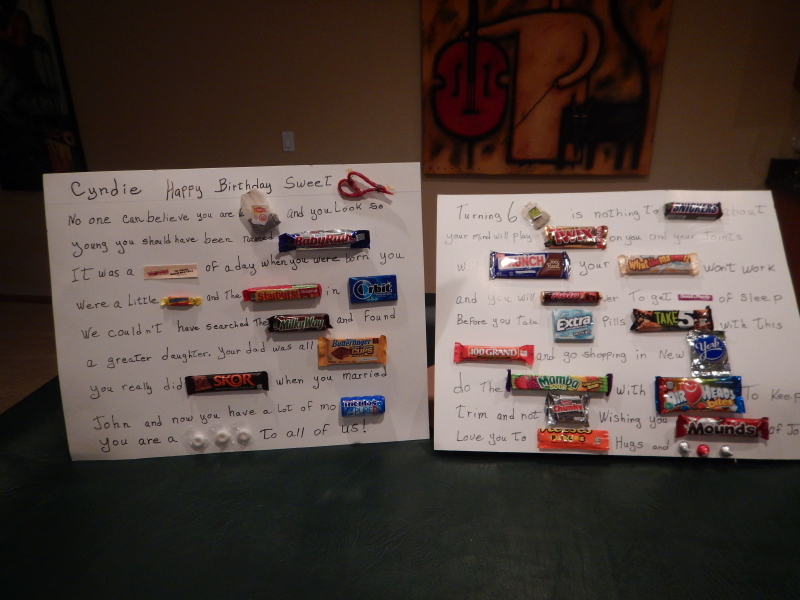 I didn’t see if Cyndie, or nieces and nephews, ended up with the haul when it was deconstructed. Marie set out well-loved appetizer choices and Carlos enlisted assistants to put finishing touches on place settings for dinner. Truly works of art that lifted the evening to out-of-this-world (and incomparable) levels. The meal was some of Marie’s best beef tenderloin ever, garnished with just the right compliment of potato, vegetables, salad, and bread. Of course that was finished with Norwegian Cream and some obligatory birthday cake. It was truly a wonderful evening. The best of everything family. 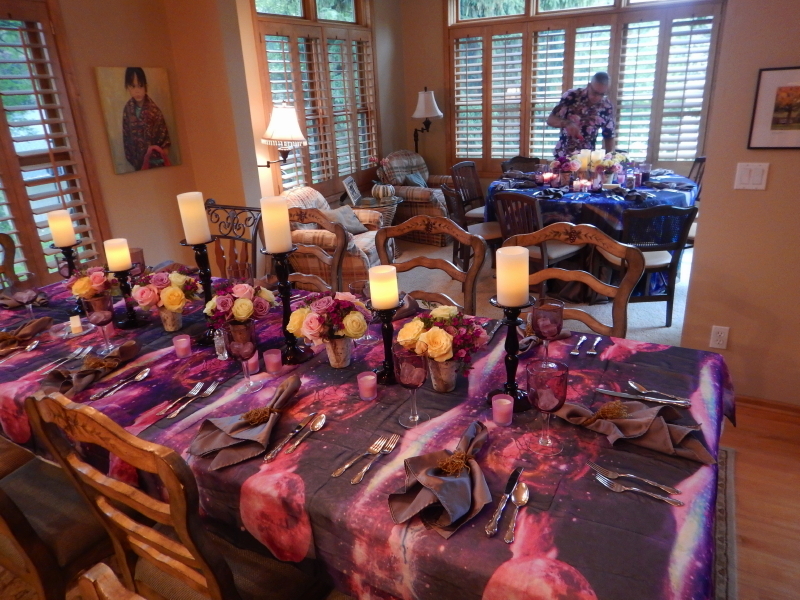 There is no questioning the Friswold’s ability to put on a special birthday party. 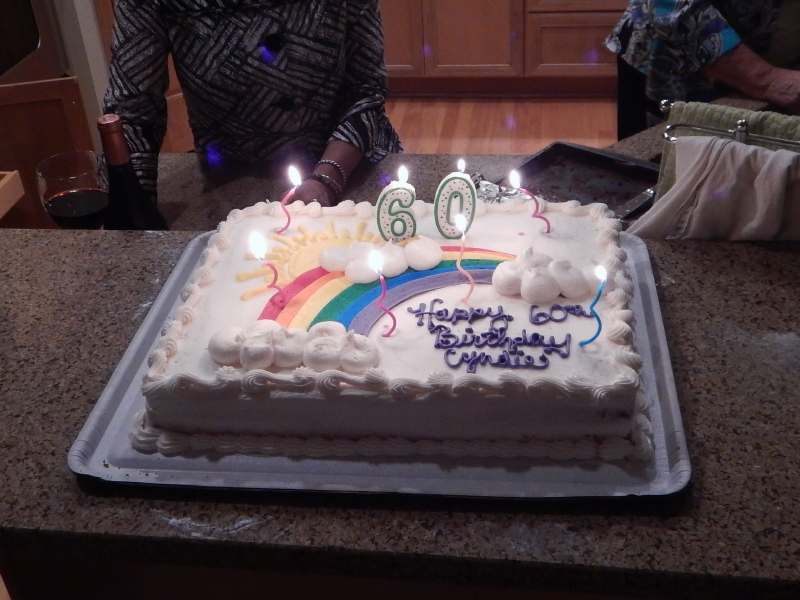 The entire weekend was an absolutely perfect way to celebrate sixty years of Cyndie’s amazing life. 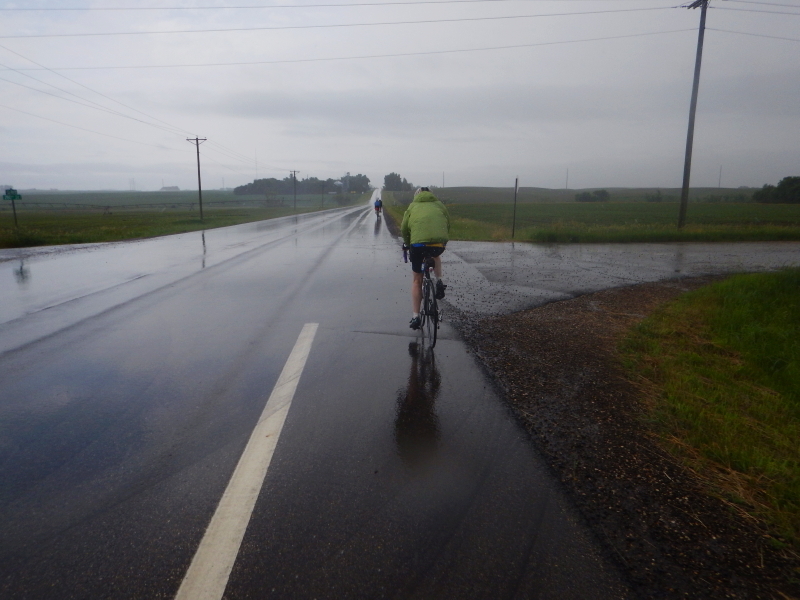 No time to write on and on about absolutely everything we’ve already done (yesterday) that was incredibly fantastic to celebrate Cyndie’s big birthday (that actually transpired last Monday), because I am heading out early this morning to put on more bike miles with her brother, Ben. 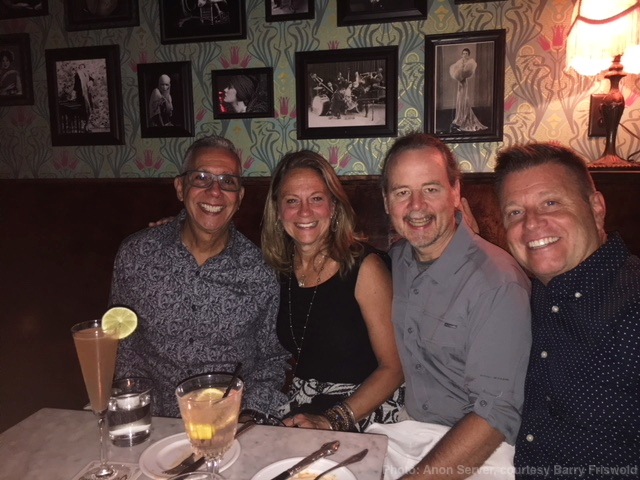 But… I must at the very least mention the superb speakeasy in Uptown Cyndie picked for a first-stop before the spectacular dinner in downtown Minneapolis that we enjoyed with Barry and Carlos last night. In classic form, the entrance is virtually invisible. We reached the appointed address on Lake Street, but made the rookie mistake of hunting inside the front door of said address. 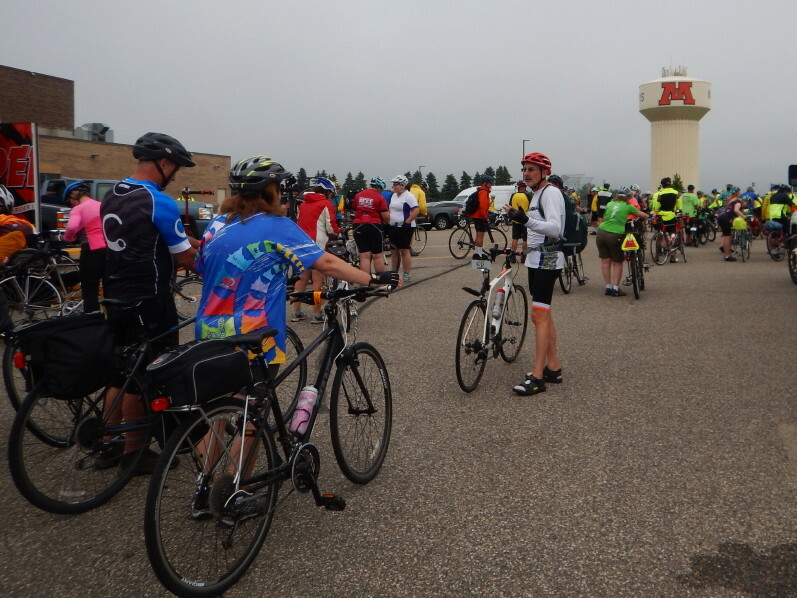 A charitable resident recognized our obvious “searching” mannerisms and gave away the secret. Of course. Walk through the alley to the back side of the building, go around the dumpsters, look past the HVAC unit for a metal door with a covered slit for a window. Rap on the door and the cover slides open to reveal two eyes asking if we are there to look at their hats. The door opens and we step inside, where our ID’s need to be checked to find out our “hat size.” Then it is down the stairs into the ultimate destination for some drinks and eats in a perfect atmosphere depicting our perception of what a speakeasy of yesteryear might have been like. The only other thing they could have added to enhance the experience would be a police raid with us scrambling out a back way to escape. A beautiful night, great food, and precious company celebrating a special birthday girl. It couldn’t have been any easier than that. Well, I’m glad that’s finally over. We got all that crazy birthday celebrating out of the way for Cyndie yesterday with a dinner out for the core four –us and our two adult children. That takes care of that for another year. Oh, have you met Cyndie’s family of origin? Last night was far from the end of birthday festivities for her. There still remains almost a week of planned events, including family coming in from out-of-town, more dinners out, music and dinner at the Dakota downtown, a dinner in, and who knows what else they have yet to reveal. 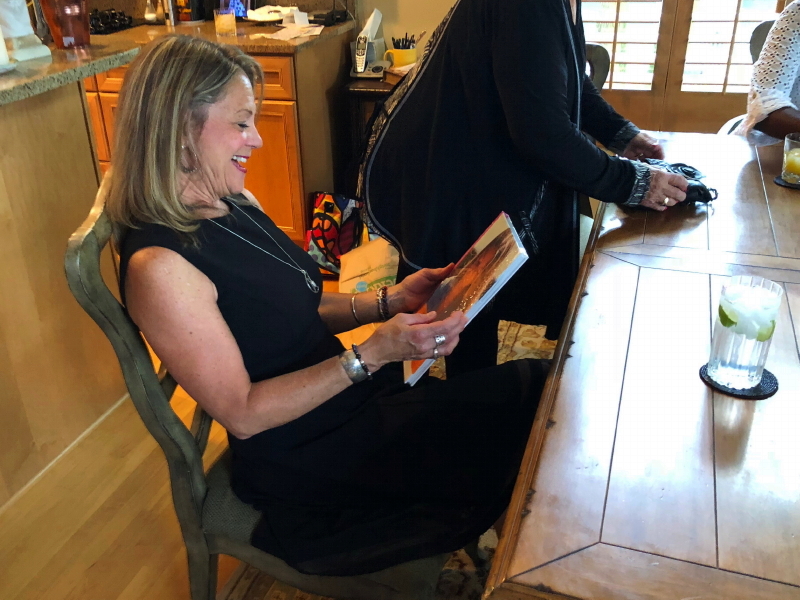 Yesterday, Cyndie treated herself to a spa/massage session in the morning and topped off her day with the core four dinner at the very trendy “Young Joni” restaurant in North Minneapolis. It was too popular to get an open reservation, so we settled on sitting at the bar to eat. I would say the popularity is deserved. We had an excellent experience. After we got home, we learned the restaurant was a product of our friend Mike Wilkus’ architectural firm. No wonder it felt so comfortable to us. 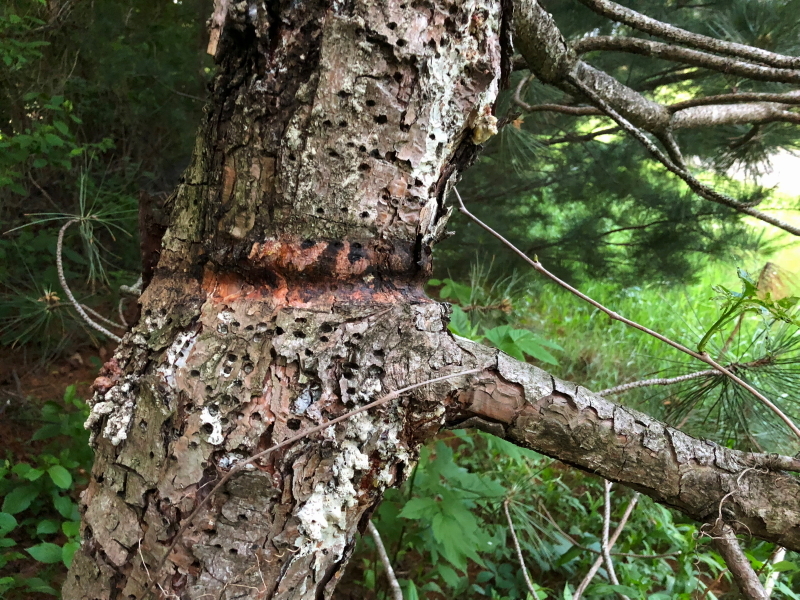 While walking Delilah when I got home, I remembered to tend to a tree that caught my attention when touring the property on Sunday with the DNR Forester. Don’t be this guy: Five years ago we had a wicked spring snowstorm that dropped 18 inches of snow on the 2nd/3rd of May. Many trees were damaged. To save one pine, I tied a rope to secure it to another tree to keep it from tipping all the way over. Then I forgot about. For five years. In an attempt to save the tree, I girdled it by neglecting to check and adjust the support. That’s not what I meant to do. At least the birds appear to be getting something out of the tree, but I guarantee you, they are not getting anything close to the fine cuisine the four of us enjoyed for Cyndie’s birthday dinner last night. 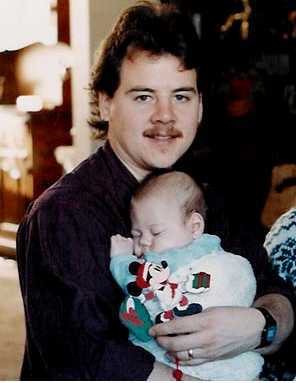 Sixty years ago today, before I was even born, the best thing that could ever happen for me took place. 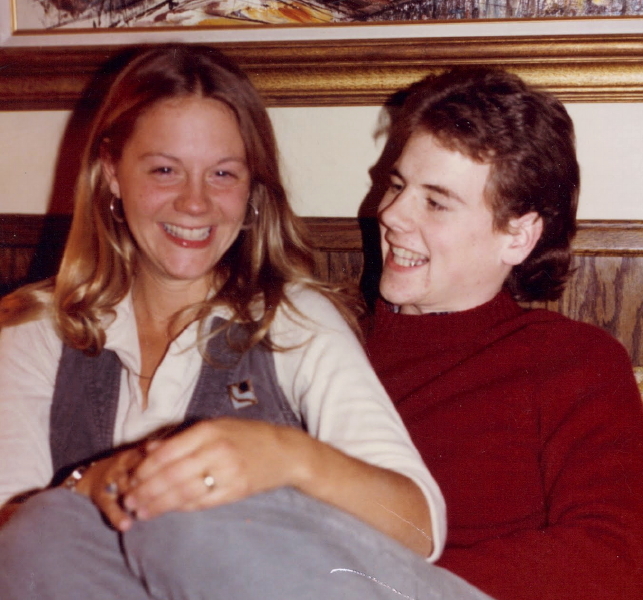 With eternal gratitude to Fred and Marie Friswold, today, June 4th, I boast to the world that it is Cyndie’s birthday! After a jam-packed weekend of social events and more, we begin this week with new information and new energy. First, after a scheduled appointment for our vet to visit and give the horses their spring shots, we came up with a plan for how we will proceed into the summer grazing season. 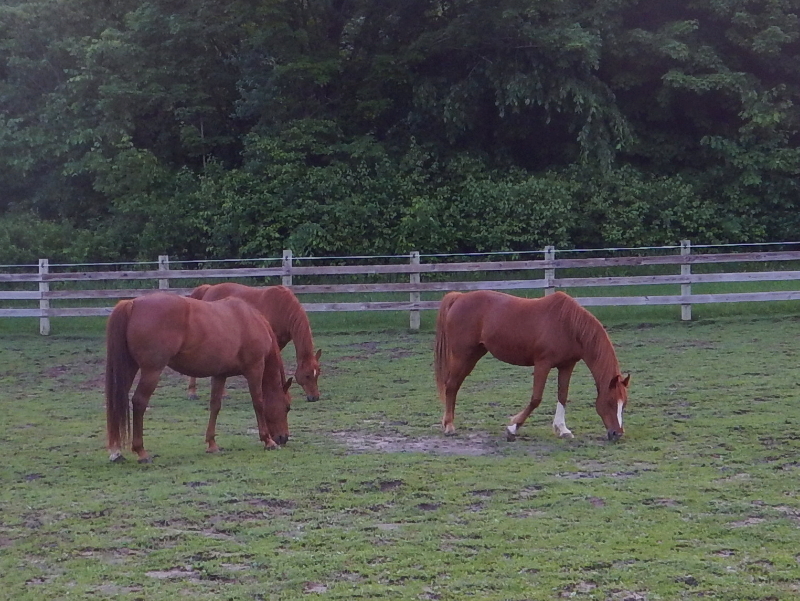 Both Cayenne and Hunter are showing signs of good health with their sensitive laminitic front hooves. The diet of reduced portions has their weight under control, and more importantly, it has been achieved with minimal evidence of angst from the horses. Going forward, we are going to work on getting them used to wearing muzzles to slow down their pasture grazing. We will then feed them dry hay in the morning to fill them up and give them muzzled access to a previously mowed (shorter grass = smaller bites of cake) pasture in the afternoons. They will be confined to the dry paddocks overnight, with no added hay available until the next morning. Most important for us will be the attitude the horses have about their situation. If they are okay with it, that will be the definition of acceptability. If they balk over any of it, we will work to adjust accordingly. Our goal is to keep their weight down, yet give them some time to enjoy the freedom to move about in the open pasture and “graze” as close to normal as possible. The next big thing that we learned came as a result of a visit from our local DNR Forester yesterday. My key takeaway from that consultation was the value of cutting trees beneath the canopy of mature trees we favor. Growth that reaches up to encroach on the lower branches of the favored tree should be removed. He asserted that the primary focus is on providing the most sunlight to encourage growth, but protecting lower branches from competition will also help keep the mature trees healthy. My first inclination is never to cut down any tree, but our Forester convinced me that cutting some will enhance others. I need to get more comfortable pruning entire trees, in the way I am comfortable pruning a few branches to shape a single tree. He suggested clear cutting some areas, like stands of aspen, to open up sunlight and entice energized bursts of new growth to expand the grove. It seems so counter-intuitive. I want more trees, not less. Apparently, a little loss now, produces bigger gains later. In his mind, it doesn’t take that long. Time is a relative thing. I’m not feeling that patient. 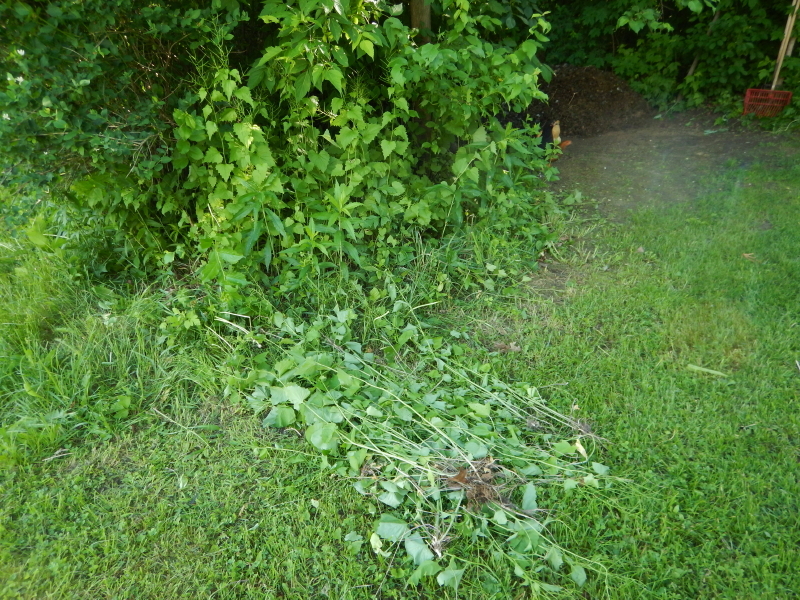 I was surprised to learn that he felt our highest priority should be to work on removing invasive garlic mustard. I did a quick Google search and the response was rich with states battling the troublesome intruder. Our Forester said we should pull the plants, bag them in plastic garbage bags and throw them in the trash. Among the many other battles we are already waging, like vines, common buckthorn, and poison ivy, we now will move garlic mustard to the top priority.